Summary: Looking for the way to recover lost call logs from Android? Here you are offered the most comprehensive and effective solution to restore deleted or lost call history from Android phone or tablet. Just keep reading to get more information. Call history is important because sometimes we need to check the call history to find someone we have not saved as a contact. However, there are various situations that can cause lost call history on your Android phone. Apart from accidental deletion, though rare, but sometimes, replacing your phone battery in an inappropriate way can lead to loss of all the personal information from Android phone. Not only does it delete your call logs, but also restores your phone to factory settings in some case. So what can you do if you need to recover lost call logs from your Android phone? You can find your answers in this article. Part 1. Is It Possible to Recover Lost Call Logs from Android Phone? The answer is YES for sure as long as you have not used a professional call logs eraser for Android phone. Like the Samsung Eraser, as a professional data eraser for Android phone, it supports to erase all data from Android device with zero opportunity of restoration, including the Android call logs as well. Anyway, if your Android call history is lost or deleted by simple deletion, factory reset, flashing ROM, rooting and and other ways that are not using a professional call log eraser for Android phone, you can easily get them back. You may ask "How to do that?" Well, the Coolmuster Lab.Fone for Android can easily recover all kinds of Android files, including lost or deleted Android call history. 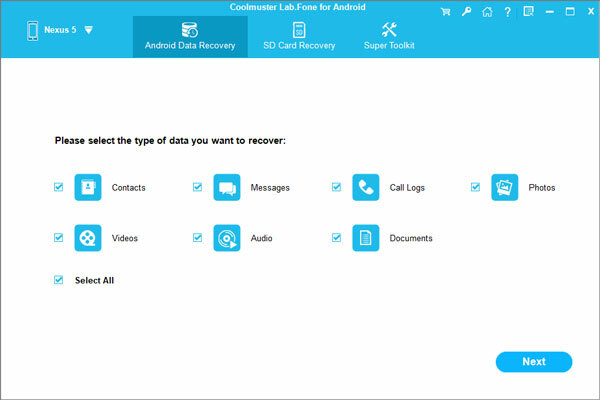 As mentioned above, as a reliable and professional Android data recovery program, the Coolmuster Lab.Fone for Android (Windows/Mac) allows you to restore deleted call logs from Android phone as well as the other lost or deleted Android phone or tablet. > Safe & Green: It guarantees a 100% safe and risk-free data recovery process on your Android device. And it will keep all the recovered Android data original with no damage or modification. Below are the free trial versions of the Lab.Fone for Android program, please download and install it on your computer and have a try. An easy guide on retrieving Android call history is offered in the following part. Step 1. Launch Android call history recovery tool. When you have downloaded and installed Lab.Fone for Android software on your computer, launch it. And you can see the primary interface of the program asking you to connect your Android phone to the computer via USB cable. Just do it and enable USB debugging mode on your Android phone to have your Android device recognized by the program. Step 2. Scan your Samsung device for wanted data. After connecting with USB, click "Refresh" button to scan out all recoverable file types, then both existing and lost files will be displayed here for choice. Just choose "Call Logs" tab to let the program to scan out and display all call history on the interface. While previewing the call history on your Android phone, you can switch on the button besides "Only display the deleted item(s)" to see deleted call logs from your Android phone only. Then you can mark all call logs you want to recover one by one. After choosing all you need, you can give a click on the "Recover" button to motivate the recovery process. Wait a few seconds, you get what you want. How to Recover Lost Screenshots on Android Phones? Tip 1. How to check call duration? If needed, you can check call duration of a certain contact by going to LOG > MORE > Call Duration where you can view the duration of the last call, received calls, dialed calls and all calls. Tip 2. How to find a call log from list quickly? You can launch the Phone app from the Home screen, then go to LOG > MORE > filter by and choose some option like "All calls", "SIM 1", "SIM 2", "Missed calls" and "Rejected calls" to narrow your search. Tip 3. How to manage call logs on Android? You can manage call settings on Android by going to LOG > MORE > Settings where you can set up your calling, such as call blocking, call alerts, Contacts with numbers, Answering and ending calls, identify unsaved numbers, Swipe to call or send messages and more.